The penultimate round of the 2011 Formula 1 season, the Abu Dhabi Grand Prix was staged Sunday by a qualifying that saw Red Bull Racing's Sebastian Vettel pull some magic to take pole away from the fast in practice McLarens. Capturing a 14th pole in the single season (equaling the 1992 mark set by Nigel Mansell driving the radically-advanced Williams-Honda), Vettel was on course to equal another benchmark of 13 wins in a season if he could take victory at Yas Marina and the next round at Interlagos in Brazil. 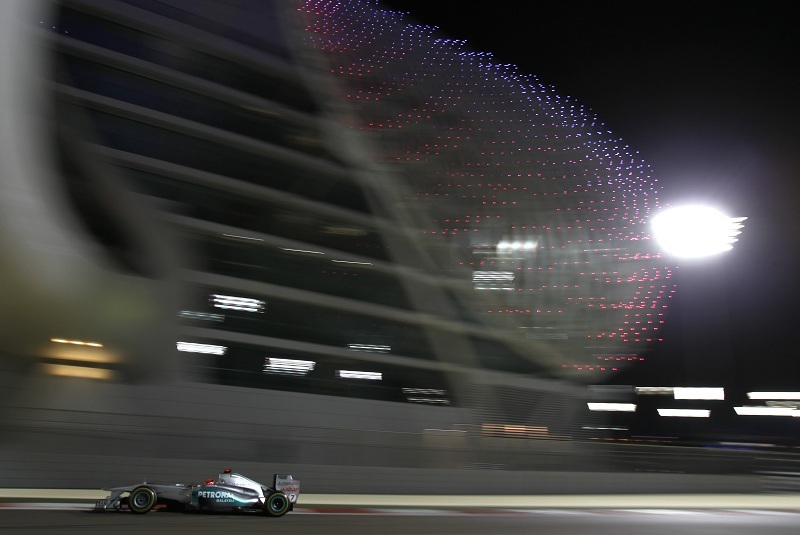 The first two Abu Dhabi Grand Prix events has been a playground for Sebastian Vettel as he took victory in both races. With many factors in favour of Vettel's victory for 2011 at Yas Marina ahead of the grand prix, auto racing rarely cooperates with history. Winning 11 races during the 2011 season, the Abu Dhabi Grand Prix would not be another top podium run for Sebastian Vettel. On the start of the race, a right-rear tire puncture with Vettel's Red Bull-Renault dramatically affected the proclaimed 2011 Formula 1 champion. Spinning in the second corner of the first lap, Sebastian Vettel limped his car to pit road where it was officially retired. A monumental event within the Abu Dhabi Grand Prix, Sebastian Vettel's early exit from the race marked a rare moment in modern Formula 1. Not only was this Vettel's first race of 2011 where he failed to score a point but the Abu Dhabi Grand Prix was the first time since the 2010 Korean Grand Prix that the two-time driver's champion's Red Bull-Renault did not finish. With Sebastian Vettel removed from the event, the second-place starting McLaren-Mercedes car of Lewis Hamilton inherited the race lead. While Hamilton's McLaren soared to the front, teammate Jenson Button immediately fell victim to a challenging Ferrari piloted by Fernando Alonso. Alonso took second place on the race track ahead of the first lap completion. Button fought an issue with his KERS (Kinetic Energy Recovery System) hindering the Englishman's performance through the remaining 54 laps of the Abu Dhabi Grand Prix. Behind Button through the event, the remaining Red Bull-Renault wheeled by Mark Webber campaigned the team colours in 4th place. Resorting to a three-stop strategy, Webber held off running the medium compound Pirelli tires until the last laps of the race. 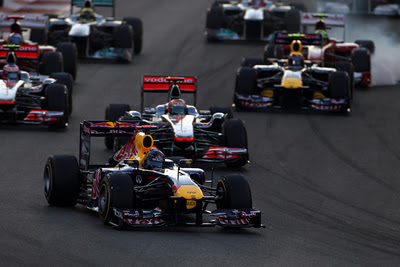 Running third at the time, Webber's lap 54 pit stop dropped the Red Bull Racing car out of the podium position. This grand prix was the first Formula 1 race of the season to be lacking representation by the Red Bull Racing team. With exception of a few laps during pit stops, Lewis Hamilton flew around the 5.554-kilometer Yas Marina Circuit to a comfortable 8.4-second victory over Fernando Alonso. Leaving the Ferrari driver Alonso lonely on the podium, Jenson Button soldiered to a third place finish. As Mark Webber crossed the line for the Abu Dhabi Grand Prix in 4th, the Red Bull Racing car was followed by the Ferrari of Felipe Massa along with the two Mercedes GP vehicles seeing Nico Rosberg ahead of Michael Schumacher. An honourable mention in the finishing results of the Abu Dhabi Grand Prix goes to the Williams F1 machines of Rubens Barrichello and Pastor Maldonado. Starting on the 12th and final row of the race due to an oil leak on Barrichello's car and a grid penalty on Maldonado's vehicle, both drivers made massive improvements to just miss the points-paying top-10. Brazilian Rubens Barrichello surged 11 positions to 12th while Pastor Maldonado climbed 9 spots to 14th in the final running order. 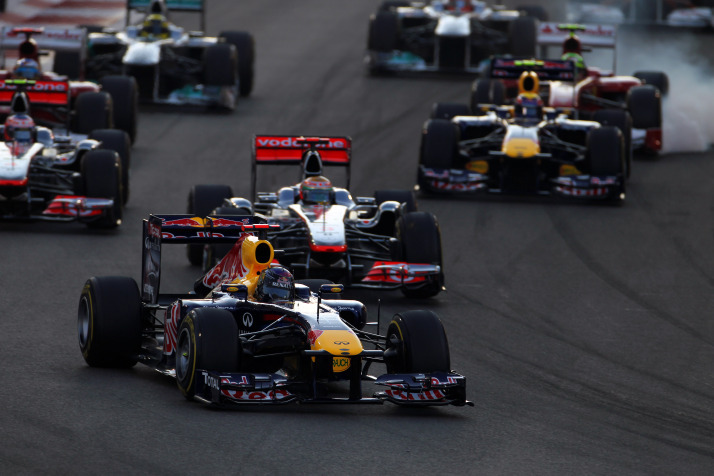 Capping the 2011 edition of Formula 1, the Brazilian Grand Prix is set for November 27th.